Are These the Most Influential Young Zimbabweans Under 40? Jah Prayzah, Kirsty Coventry, Carl Joshua Ncube, Enzo Ishall, Madam Boss and Jah Signal. The Gorindemabwe Frontier has released the 2018 list of 100 most influential young Zimbabweans under the age of 40. According to Gorindemabwe founder, Walter Chimene, the exclusion of prominent figures such as Movement for Democratic Change leader, Nelson Chamisa, Star FM presenter, Pathisani Sibanda and Hollywood actress Danai Gurira was due to the fact that they have reached 40. Ecocash Chief Executive Officer, Natalie Jabangwe tops the 2018 list followed by hotshot Advocate, Thabani Mpofu. 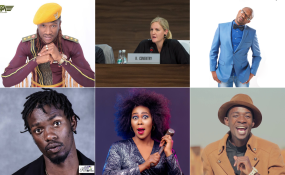 Other notable figures on the list includes Sports minister, Kirsty Coventry, Jah Prayzah and Zimdancehall new kid, Enzo Ishall of the Kanjiva fame.